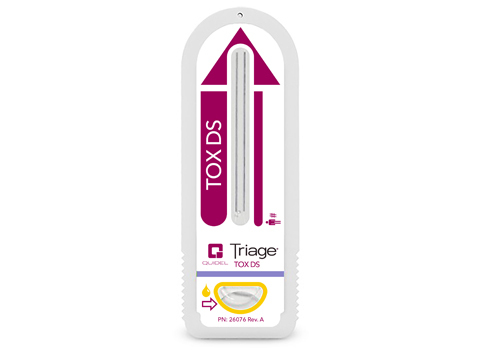 The Quidel Triage TOX Drug Screen is a fluorescence immunoassay to be used with the Quidel Triage MeterPro for the qualitative determination of the presence of drug and/or the major metabolites above the threshold concentrations of up to 10 distinct drug classes, including assays for acetaminophen/paracetamol, amphetamines, methamphetamines, barbiturates, benzodiazepines, cocaine, methadone, opiates, phencyclidine, THC and tricyclic antidepressants in urine. Built-in QC satisfies daily QC, External POS/NEG QC run once per month. Patient sample is automatically analyzed against the lot-specific, multi-point calibration curve provided via the CODE CHIP™. Customizable panels with Test Select™. Qualitative POS/NEG results are displayed, printed and can be transmitted. Batch mode capability allows for increased throughput.